A pilot housing project modeled after a similar program south of the border aims to get 40 homeless people off the streets of Waterloo Region before the end of this winter. 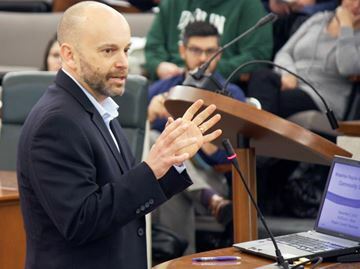 Tim Richter, president and chief executive officer of the Canadian Alliance to End Homelessness, outlines the 20,000 Homes Campaign during a community debrief this past Wednesday morning (Dec. 3) detailing the results of a regional homelessness survey completed earlier this month. Dubbed the 20,000 Homes Campaign, developed by the Canadian Alliance to End Homelessness (CAEH), the program’s goal is to help house 20,000 homeless people throughout Canada by July 1, 2020. Waterloo Region’s pilot will target the most vulnerable members of the region’s homeless community. That work will build off the information collected from 281 surveys completed by homeless individuals or families in the region between Nov. 30 and Dec. 1. The results will provide aid workers with a snap-shot of the demographics of the region’s homeless population, along with their health challenges in order to identify those who are most in need.